Ya Ali Madad. The 58th anniversary of our beloved NOOR Mowlï¿½nï¿½ Shï¿½h Karim Al-Hussaini's (a.s.) accession to the masnat of Imamat will be celebrated on July 11, 2015. As Laylat al-Qadr (The Night of Power and Majesty), the 23rd night of Holy Ramadan, will commence on the Thursday evening, July 9, 2015, we would like to extend our heartfelt felicitations to global Jamat for these auspicious occasions. The fifth ayat of Surah Fatiha is 'Iyyaaka Na'budu wa Iyyaaka Nasta'een' which means 'Thee alone we worship and Thee alone we seek for help'. In this article, let us explore concept of seeking for help which is described in the second half of the above-mentioned ayat. O Allah, forgive us our sins, and give us our bread, and have mercy upon us, in the name of Your closest Messengers, and Your Holy Imams and in the name of our Lord and our Imam, Shah Karim Al-Hussaini. It is possible to recite a simple supplication and go into prostration by just saying: 'Allahum-maghfir lana zunoobana, werzuqna, werhamna, Allahumma Laka Sujoodi wa Ta-'ati' which would mean 'O Allah, forgive us our sins, and give us our bread, and have mercy upon us. O Allah to You is my prostration and obedience'. This is perfectly acceptable but we would be asking everything based only on our strength of supplication. However, when we recite the supplication and invoke in the names of Allah's closest Messengers and Allah's Holy Imams and the name of our Lord and our Imam, Shah Karim Al-Hussaini, the strength of our supplication increases tremendously. Here we are applying the principle of divine ubiquity: 'Wherever ye turn, there is the Face of God' (2:115) as described by Reza Shah-Kazemi in section 2 of this article. These Holy personalities were the bearers of Light (Noor) and are the channels through which the Divine Light (Noor) flows. Since the Light (Noor) of Allah, the Holy Prophets, the Holy Imams and Noor Mowlana Hazar Imam is just one Light, we are seeking everything from Allah with the immense help of the Holy Prophets, Holy Imams and the present Imam, Noor Mowlana Shah Karim Al-Hussaini Hazar Imam. 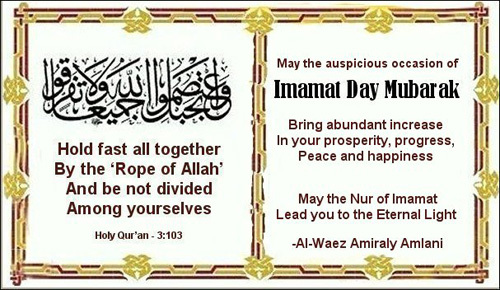 Thus, the prayer in the fourth part of the Holy Dua is unique because it also calls upon the Light of Prophets and the Light of Imamat from the time of Noor Mowlana Murtaza Ali (a.s.) to Noor Mowlana Shah Karim Al-Hussaini (a.s.), the present and living Imam. In the sixth part of Holy Dua, we first recite Surah Ikhlas and supplicate to Allah in the name of Panj Tan Pak, the 48 Holy Imams and the 49th present living Imam. The key supplication is 'O Allah, have mercy upon us and forgive us our sins. Verily, You are Omnipotent. And All praise is due to Allah, the Lord of the worlds'. "Shah-Jo-Didar" "May you be blessed with the Holy Didar of our Lord." From the above, it is clear that we are specifically taking the names of Panj Tan Pak, the 48 Holy Imams and the 49th present and living Imam for harnessing help and seeking barakat of Allah through the channel of Light of the Panj Tan Pak and the Light of Imamat. Thus, the prayer in the sixth part of the Holy Dua is also unique because it also calls upon the Light of Panj Tan Pak and the Light of Imamat from the time of Noor Mowlana Murtaza Ali (a.s.) to Noor Mowlana Shah Karim Al-Hussaini (a.s.), the present and living Imam. We are indeed blessed to say this prayer! In the firman made on December 13, 1964 in Karachi, Noor Mowlana Hazar Imam said that 'his Noor has indicated to you where and in which direction you must turn, so as to obtain spiritual and material satisfaction'. I have taken this firman to my heart and am now doing dhikrs which call on the Noor directly because in my heart, Noor Mowlana Shah Karim Al-Hussaini (a.s.) is the pillar of Light and is represented by the words 'Noore Karim' in the dhikrs. I firmly hold on to this luminous pillar in my dhikr of selected tasbis from the 99 Beautiful Names as shown in the table below. Laylat al-Qadr Mubarak!